After five year of having my Nikon D200 as a primary photo camera, it was time to upgrade. Budgets and the market what they are, I settled for the Nikon D7000. What are the differences? For me, the D7000 was on the one hand a step back, and on the other a huge leap forward. An overview of my findings. 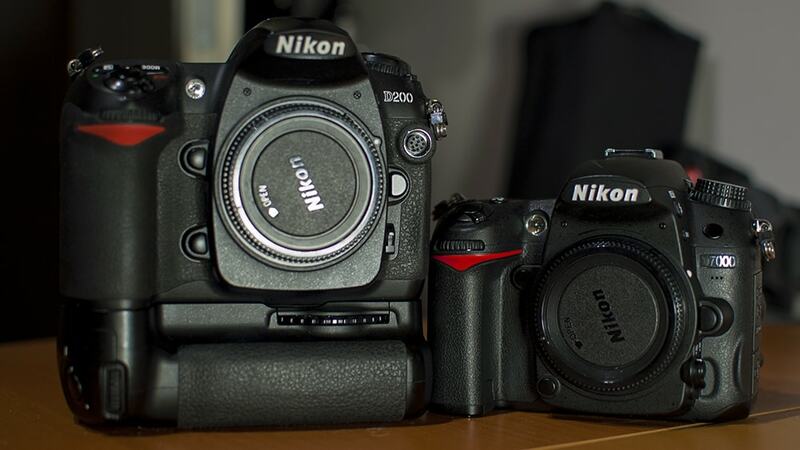 The D7000 is much smaller and lighter. This makes it a little more portable, but it feels like a toy camera. Also my hands are a little too big for it. The D200 had lots of quick manual controls. I could blindly find how to set ISO, white balance, and it had an AF-ON button. These controls exist on the D7000, but they are hidden under regular buttons. So you need to look at the back of your camera to see what you are doing. The D7000 has pretty good sensor cleaning. This is a big plus for me. The D200 didn’t have any form of dust reduction, which made me very apprehensive of changing my lenses on the road. The D7000 takes the worry away, and in doing so expanded my creativity. The D7000 shoots video. Sure, not as awesome as the D800 or the new D7100, but it was for me the first affordable obtainable way to shoot high quality video, with my professional f2.8 glass. The D200 had much better build quality. It feels like a tank. It feels like you can beat someone up with it. The D7000 feels plastic. If I were to punch someone in the face with it, I fear it might break. The D7000 has 100% viewfinder coverage. And liveview too. The 100% coverage is a huge leap; It saves you from cropping unwanted elements out of your pictures. You always see what you will get. The D7000 has a much quieter shutter than the D200. It seems small, but it helps. The D200 has much better battery life than the D7000. “Then stop using the video function!” I hear you cry. Yeah. The best camera for me would be the D200 body, with the innards of the D7000, or D7100. Yet current market developments seem to make it very doubtful if such a D400 will ever see the light of day. In the mean time I will enjoy my D7000 to the fullest, and try to focus on improving my photographic skills.